CRA has completed a natural gas well testing program and is continuing data assessment of the company’s exploration activities at Whicher Range, south of Busselton. The review has included analysis of the most recent well testing program and a detailed study of almost 50 years of past exploration work. The results confirmed our confidence in the technical feasibility of conventional natural gas production (allowing the gas to flow freely from the reservoir to the surface). This evaluation has confirmed our view that unconventional production – or fracking – will not be successful. It’s a technology we have not and will not be utilising at Whicher Range. Additional data (reservoir pressure monitoring) is necessary to complete both our technical and commercial analysis. A revised commercial assessment of the project during 2018. We will also be undertaking ongoing care and maintenance of the suspended wells and associated well site areas, in accordance with an environment plan under assessment by the Department of Mines, Industry Regulation and Safety. CalEnergy remains focused on the Whicher Range resource and we will continue to keep the community informed of our progress. It is disappointing that much of the recent public commentary on the project has been misguided, misleading – or both. Our recent efforts remain prioritised on getting all the data and analysis results we need to make informed decisions. Only then can we determine the nature of any future project activities. References in the local media to a recent university paper presented at a conference in Saudi Arabia have absolutely no relevance to our project. 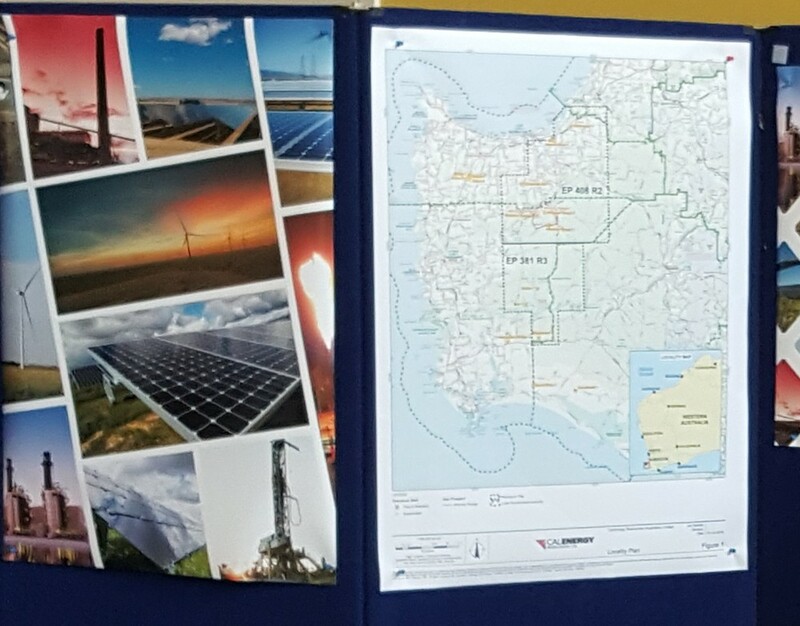 More than 150 people took the opportunity to learn more about gas exploration plans for the State’s southwest, including CalEnergy’s Whicher Range project, during the Shire of Capel’s inaugural Gas Exploration Expo held on July 26th. CalEnergy participated in this inaugural community information session, which brought together members of the local community and other interested people to communicate and share information about local onshore gas exploration. We were delighted so many people took the chance to come and meet us and talk about our Whicher Range project. Managing Director Peter Youngs was joined by our Subsurface Manager and Whicher Range Asset Manager Celine Gros, and Richard Bilman, our Corporate Integrity & Compliance Manager. We spoke to many people, one-on-one, throughout the 5-hour session explaining aspects of the Whicher Range conventional gas project. Many questions were about fraccing and we were able to provide information to explain why CalEnergy has not and will not undertake fraccing in the South West. Peter Youngs said the Expo also provided the perfect platform for CalEnergy to launch our Unequivocal Commitment to Land Owners. Peter said the Expo provided information on the status of activities, and potential future activities at CalEnergy’s Whicher Range exploration permit (EP408) and most importantly allowed us to hear first-hand, questions and issues important to the community and our stakeholders. CalEnergy is evaluating the results of the company’s exploration program at Whicher Range - a major gas field in the South West Region of Western Australia. The exploration work has been focused on an area 20 kilometres south of Busselton and 280 kilometres south of Perth in Western Australia (WA). Whicher Range is a conventional gas field which will not require the use of hydraulic fracturing (or fraccing). The gas field is, potentially, a competitive new source of energy for homes, industry – and the extensive mineral processing sector in the region. If the program is successful and a development goes ahead, the project would generate jobs, business opportunities and diversification of the regional economy. In May, we conducted scheduled integrity tests and routine maintenance at both the Whicher Range-4 (WR-4) and Whicher Range-1 (WR-1) well sites. The integrity of both wells was verified and confirmation was provided to the industry regulator. CalEnergy continues to evaluate the data from the December 2015 well testing program at the WR-4 well site and we expect to have a good idea of the results next year. The current evaluation process will help us to analyse the commercial viability of the Whicher Range gas resource, and ultimately help us determine if there’s any potential to provide gas to WA’s South West. The complete technical evaluation will inform the company of next activities associated with the Whicher Range gas field. Our next series of meetings with our Whicher Range stakeholders occurred in June 2016. Our Managing Director, Peter Youngs, and our Subsurface Manager / Whicher Range Asset Manager, Celine Gros, met with our neighbours, local community members and Local Government, to bring everyone up to date on the Whicher Range project and answer any questions our stakeholders had. As part of our corporate commitment to responsible environmental management and community engagement, CalEnergy has commissioned within the Whicher Range gas field area, independent expert studies on water, soil and flora and fauna. This is an essential component of our responsible environmental management of future activities at Whicher Range. We demand high standards of corporate responsibility and environmental stewardship. Our approach to baseline monitoring has included consultation with the relevant Western Australian regulatory departments. At key program milestones, and on completion, we will provide updates to our regulators, neighbours and other community stakeholders (via regular stakeholder consultation) and inform our registered community members. We are evaluating our drilling and well test data results which will take several months to conclude. A full technical and commercial evaluation will take further time. We look forward to engaging openly and sharing findings with the community about this important extension to our local environmental commitment. Additionally, there’s already extensive water monitoring from approximately 100 Department of Water and Water Corporation operational wells within our licence area. On December 2, 2015 CalEnergy hosted an open invitation public tour of our Whicher Range (WR-4) site outside Busselton. Guests from the Busselton, Capel and Margaret River areas representing the community including special interest groups, local government, community resident associations and our neighbours, spent about three hours with us discussing the project and touring the site. The media was also offered the opportunity to visit. CalEnergy’s Managing Director, Peter Youngs, our Australian Business Unit Manager, Travis Enman, and our Corporate Integrity and Compliance Manager, Richard Bilman, provided information and answered questions about the project. CalEnergy's Wellsite Manager gave an overview of the current well testing phase at the operational site. CalEnergy works hard to keep the community informed about our work and the tour provided a timely opportunity for us to talk openly with key community stakeholders about where the project is at and to demonstrate our willingness to share information and answer questions from community members and our stakeholders. Many guests commented positively about the professionalism shown in all our operations. CalEnergy is committed to keeping the community well informed and also to receiving feedback from you. We invite you to join our Community member list for updates and future site tours.